This shirt by J. Otto Seibold sports a tree-dwelling, hat-wearing bird and a magically levitating cigar-smoking telephone. It's all an advertisement for the (now defunct) Dial-A-Song, what else? 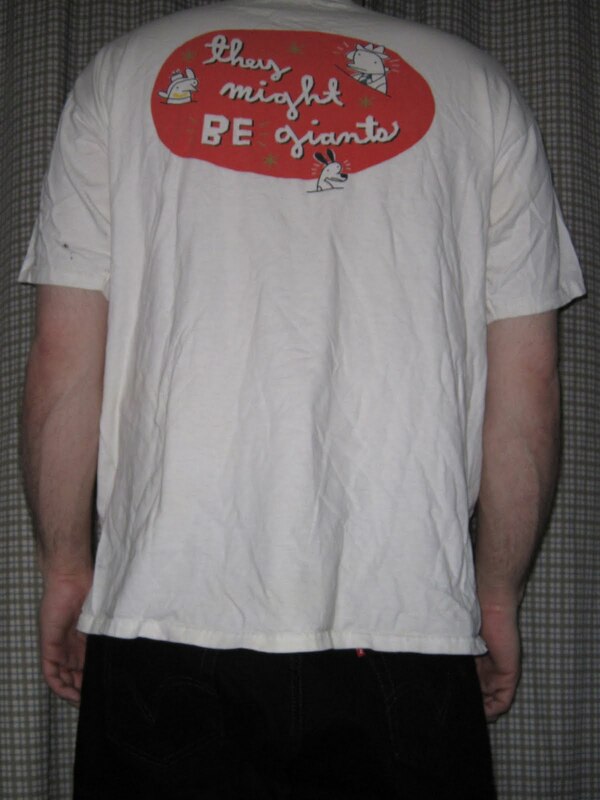 The back has the band name surrounded by several classic looking J. Otto characters. They opened the show with this classic at the Chameleon Club in Lancaster, PA on 7/28/11. It's The Mesopotamians: Sargon, Hammurabi, Ashurbanipal and Gilgamesh! 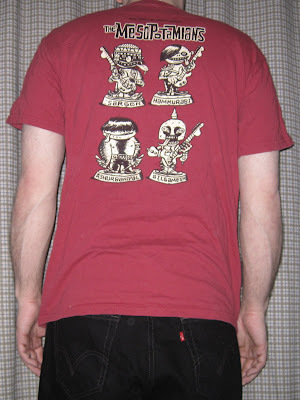 A closer look at this shirt reveals the aforementioned troglodytes hanging out on and around their name. 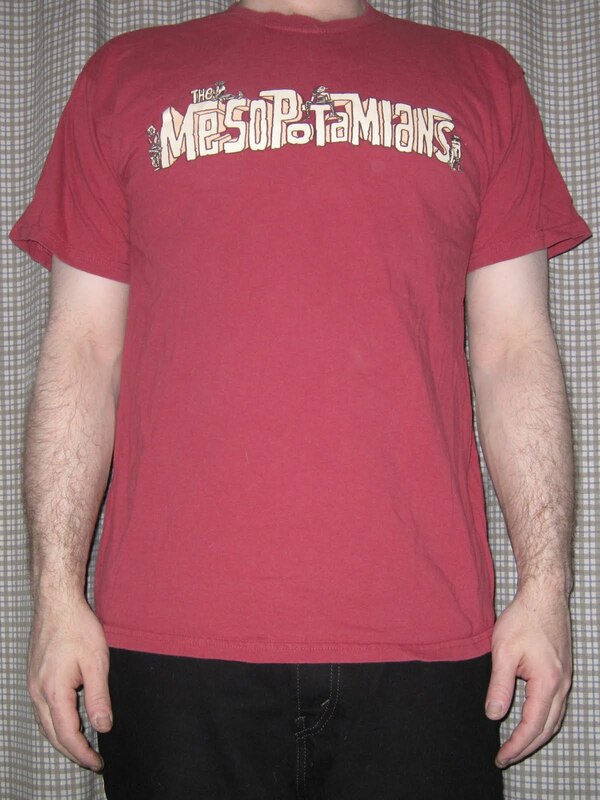 The Merch Store currently only has the women's bright red version available. Some nice Mesopotamian Bobbleheads on the back. Design by David Cowles, who also directed the video. 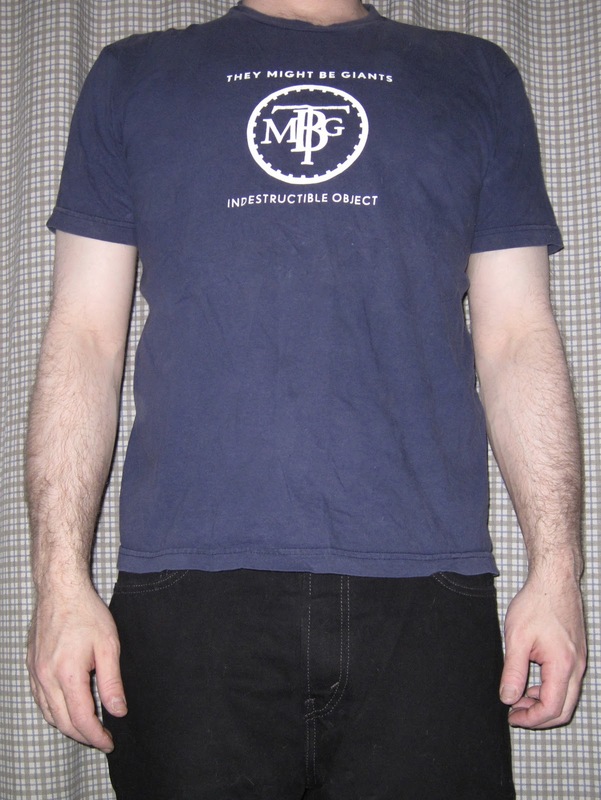 This Indestructible Object t-shirt is the natural complement to the EP of the same name. 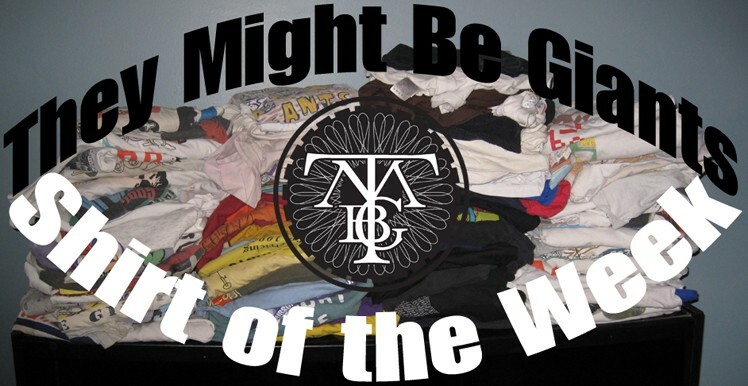 It features a modified version of the familiar logo, with TMBG above and IO below. 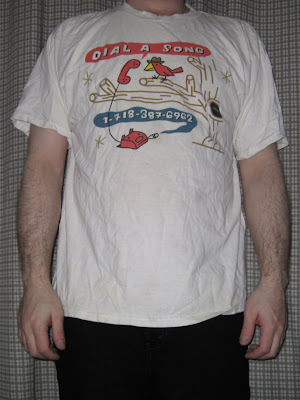 By the way, I take a large but I also own this shirt in medium for when I want to feel extra indestructible. 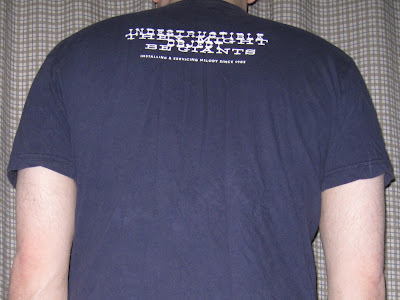 The back has the band name superimposed over that of the EP, followed by their time-tested slogan: "Installing & Servicing Melody Since 1982". 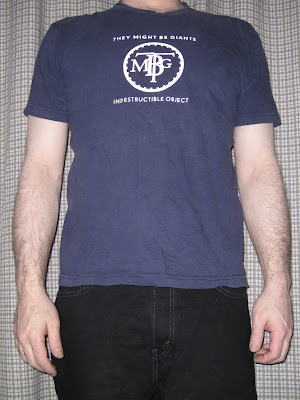 Buy "Indestructible Object on Blue" at the TMBG Merch store. This worldwide debut of this metarrific Join Us song is uncharacteristically the best that They'll ever play it. Performed at the Chameleon Club in Lancaster, PA on 7/28/11. You can also see my YouTube video of this. 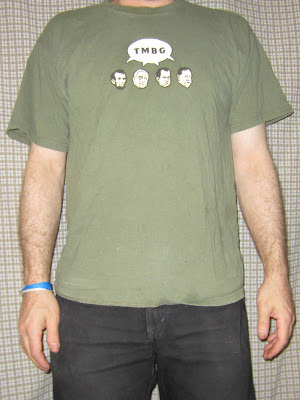 Here's a shirt that commemorates The Chopping Block days of tmbg.com, when firing at a shooting gallery of icons would cause floating presidential heads to cough up links to different parts of the site. As on the front page, the front of the tee features Abraham Lincoln, Theodore Roosevelt, Richard Nixon and Howard Taft (from left), proclaiming the initials of their favorite band. 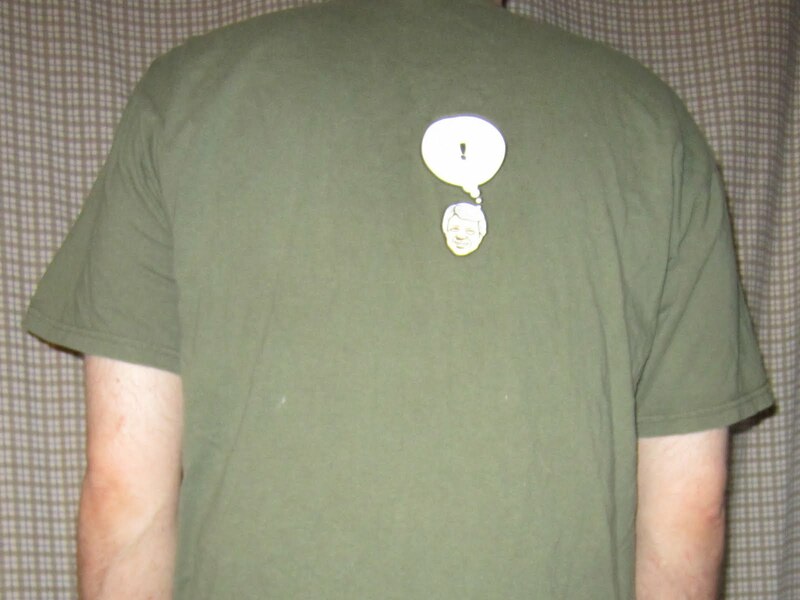 I also have a light blue version of this shirt. 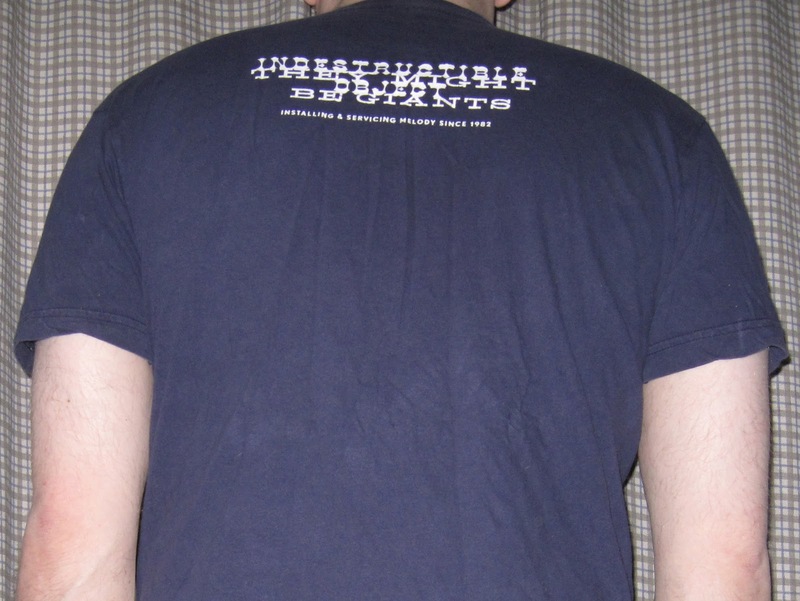 On the back, bonus POTUS Jimmy Carter hangs out, perhaps pondering why he didn't make the cut when the website was designed. His isolation has seemingly been made up for by having the shirt named after him. Buy "Carter on Green" or "Carter on Blue" from the merch store today, and get presidential! Performed at the Stone Pony in Asbury Park, NJ on 7/30/11.